Gland is an organ or group of specialized cells in the body that produces and secretes a specific substance, such as a hormone. Typically, a gland consists of either cuboidal or columnar epithelium resting on a basement membrane and is surrounded by a plexus, or meshwork, of blood vessels. Endocrine, or ductless, glands (e.g., pituitary, thyroid, adrenal) secrete substances known as hormones directly into the bloodstream rather than through ducts. Exocrine glands (e.g., salivary, sweat, digestive) discharge their products through ducts. Every gland is formed by an ingrowth from an epithelial surface. This ingrowth may in the beginning possess a tubular structure, but in other instances glands may start as a solid column of cells which subsequently becomes tubulated. The secretions of exocrine glands are released through ducts onto an organ’s surface, while those of endocrine glands are released directly into the blood. The secretions of both types of glands are carefully regulated by the body. 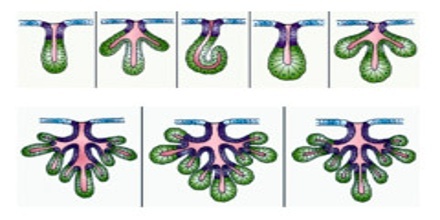 In many glands, the number of branches is limited, in others (salivary, pancreas) a very large structure is finally formed by repeated growth and sub-division. As a rule, the branches do not unite with one another, but in one instance, the liver, this does occur when a reticulated compound gland is produced. In compound glands the more typical or secretory epithelium is found forming the terminal portion of each branch, and the uniting portions form ducts and are lined with a less modified type of epithelial cell. 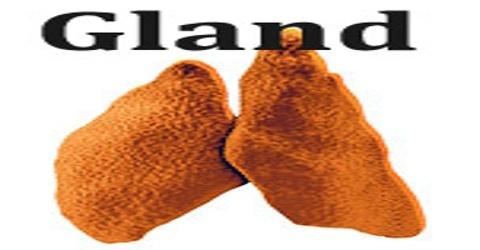 Glands are classified according to their shape. If the gland retains its shape as a tube throughout it is termed a tubular gland. In the second main variety of gland the secretory portion is enlarged and the lumen variously increased in size. These are termed alveolar or saccular glands. Exocrine gland secretions include saliva, perspiration, oil, earwax, milk, mucus, and digestive enzymes. The pancreas is both an exocrine gland and endocrine gland; it produces digestive enzymes that are released into the intestine via the pancreatic duct, and it produces hormones, such as insulin and glucagon, which are released from the islets of Langerhans directly into the bloodstream. Exocrine glands are made up of glandular epithelial tissue arranged in single or multilayered sheets. 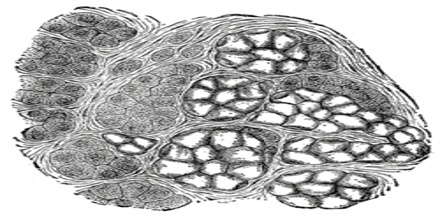 Exocrine gland tissue does not have blood vessels running through it; the cells are nourished by vessels in the connective tissue to which the glands are attached. Gland cells communicate with each other and nerves via channels of communication which run through the tissue. Reference: britannica.com, dictionary.com, science.jrank.org, wikipedia.